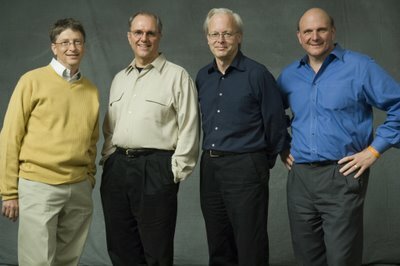 Will Microsoft be Microsoft without Bill Gates? Today Bill announced that 2 years from today, July 2008, he will reorder personal priorities and work part time at Microsoft and full-time at the Bill and Melinda Gates Foundation. Ray Ozzie will become the new Chief Software Architect. Craig Mundie will become Chief Research and Strategy Officer. I must admit that I’m impressed by Bill’s realization that, “with great wealth, comes great responsibility” and I think that he’s trying to do things that really help others worldwide. This is a good thing. The question that comes to my mind is simply this: “Will Microsoft be Microsoft without Bill Gates?” Before you try to answer this question, consider this one, “Would Apple be Apple without Steve Jobs?” I think there’s a good deal of sentiment out there that Apple is Steve Jobs, and if you remove Steve from Apple, you don’t have that visionary leadership that has been core to Apple in the beginning and especially in it’s more recent comeback. Bill Gates is a bright individual, but his “reign” at Microsoft has not been that of a dictatorship. Maybe that’s just an consequence of scale, but from my humble view of all this, Bill’s greatest genius has been in surrounding himself will other brilliant people, which is not a trivial task by the way. The collection of bright people at Microsoft isn’t going to leave in when Bill moves from full time to part time employment in two years. I think what’s less clear is how you calculate the influence of an individual at Bill’s level and account for that loss. Posted in microsoft, perspective, vision. Has Ballmer the same capacity of attraction and retaining brilliant people? Or will the brilliant people start to leave after Bill Gates leaves? In other words, will the “monkey dance” become mandatory? Apple still needs to do alot to get by without Steve. Microsoft needs this change and more. My impression is that MS and Apple are two very different companies — while Bill will certainly be missed, the absense of Steve from Apple would have a much larger impact. how much has changed since the days of IBM can be clearly seen in that none of these gentlemen is wearing a necktie, let alone the obligatory navy blue suit.